Sage GEAR Steelhead / Salmon rods are premium casting, spinning, centerline and mooching rods. These rods offer unique actions and are the most sensitive rods that you can fish. Sage GEAR Steelhead / Salmon rods are available in most all popular lengths and line ratings. 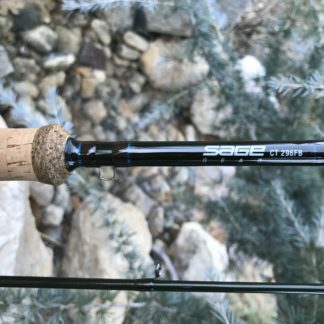 Sage GEAR Steelhead / Salmon drift spinning rod models are available in 8’6″ through 12′ models. I can help you pick the right rod for the right application if needed. Are you a steelhead or salmon fisherman fishing any of the great NW rivers? The GEAR CT286, CT290, CT296, CT390 and CT396 will cover you in any situation. These rods can be build spinning or casting. There is one travel rod available – the Sage GEAR 570-3 which is a great saltwater / Alaska travel rod. All rods come with Fuji SCI titanium frame guides which are among the best available. By default I use ALPS reel seats with matching hardware. These rods will be heirloom quality and are sure to make all your buddies jealous.